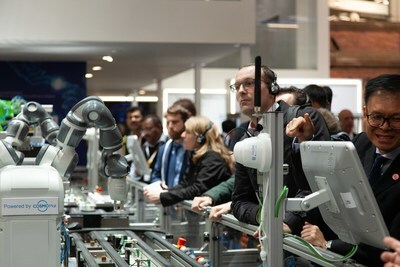 HANNOVER, Germany, April 5, 2019 /PRNewswire/ -- Haier,the tailored life solutions manufacturer brought 179 smart home solutions in 28 scenarios to Hannover MESSE, showcasing an upgraded version of COSMOPlat, the world's largest mass customization solutions platform and unveiling an innovative realization of the exhibition theme, "Integrated Industry – Industrial Intelligence". First launched in 2016, Haier's independently-developed COSMOPlat digitally integrates the entire factory process and supply chain, including interaction, R&D, and procurement, to better serve individual customers. This year's upgrade combines a diverse range of advanced intelligent manufacturing technologies and 5G to open up a new chapter of mass customization, pioneering the world's first "smart + 5G" customization verification platform with profound application possibilities for industries as diverse as ceramics, agriculture, motor home manufacturing, molds, and machinery. In addition to a large number of enterprise customers, Haier attracted several industry-leading experts to its booth, including Henning Kagermann, the father of the Industry 4.0 movement to digitize industrial production, and Francisco Betti, head of Advanced Manufacturing Industry in World Economic Forum's (WEF). "I'm thrilled to see the progress achieved by the latest iteration of COSMOPlat, now integrated with advanced technologies such as 5G and AI," said Kagermann following his tour of the Haier booth. "Not only is Haier serving large enterprises, but it is empowering SMEs to transform and upgrade as well. Thanks to the real-time updates and optimization, a larger number of customers can enjoy greater efficiency and a more user-centric experience." As the first Chinese enterprise to be selected to the WEF's network of "Manufacturing Lighthouses", a community of leading manufacturers that are integrating Industry 4.0 technologies, Haier leveraged the exhibition to co-host the WEF Lighthouse Factory Forum with Bosch, Phoenix Contact, Rold, Sandvik, and Tata Steel. Together, the companies announced the Lighthouse Program Hannover Initiative, which seeks to set and implement industry norms for standards, technology, talent, security, and more. As the leader of this cooperation, Haier's COSMOPlat will draw on its open ecosystem to promote and cultivate the initiative.